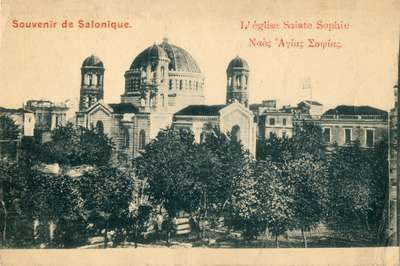 A postcard of the Agia Sofia in Thessaloniki, Greece. Salonica, or Thessaloniki, is a city and port in north eastern Greece. "Things are going on well here. But they want all the men and I hope the whole of the young able bodied men in your neighbourhood have volunteered. I hope you and Mrs. Layton & family keep well & with my kind regards to yourselves and all present.